Damm, now I’m caught up! There’s something wonderful about discovering a new series and having the books you haven’t read yet beckoning to you from a future snow day or vacation, creating a nice bit of anticipation that you’re hesitant to lose. You may have finished with the first adventure but the story goes on. Much like binge watching a good TV show on Netflix or Amazon (Travelers and Jack Ryan, I’m talking about you! ), you both want to consume faster and slow down. This is how I felt as I devoured Nick Petrie’s three book series (so far) about Peter Ash. I held off between the first book and the second, but then the third book was right there on the new releases shelf at my local library and I was powerless to resist. So, now, dammit, I’m caught up and have to wait impatiently for the publication of book #4. 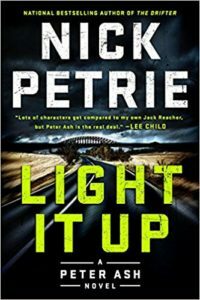 As Light It Up begins, our hero, Peter Ash, has spent the last few months trying to get a handle on his PTSD in order to pursue a relationship with June Cassidy, the woman he met in Burning Bright. They have been apart for months, but Peter writes June letters, describing his volunteer work fixing trails and bridges in the Oregon backcountry as well as revealing bits of his past experience in Iraq and Afghanistan. He is working with a therapist to try to control the panic attacks he has every time he enters an enclosed space. Both June and Peter are cautiously optimistic that they might be able to make this thing work. However, Peter delays his initial plans to visit June in order to help out Henry Nygaard, a fellow volunteer and Vietnam vet who he has become friends with. Henry’s daughter runs a security firm with her husband in Denver, a business that is booming thanks to the cash-rich nature of the cannabis trade. However, just recently, Henry’s son-in-law and another employee disappeared while on the job, their vehicle and the money they were carrying gone without a trace. Henry and Peter agree to help out for a week, but it is while they are doing what is supposed to be a simple cash run for a local grower that they are ambushed, and Peter realizes that larger forces are at work. As in the previous two novels, there’s a lot of twists and turns and Peter must bring in his friend, Lewis, to help as he faces down some powerful people. Though (as mentioned in previous reviews) there are a lot of comparisons made on the books’ dust jackets between Petrie and Lee Child, I am more and more reminded of Harlan Coben. Peter Ash feels to me more related to Myron Bolitar—a man whose capacity for violence and desire to be a better man are inextricably linked. Nick Petrie knows how to construct fast-paced suspense with people you care about and he does a nice job of creating strong female characters—something I really appreciate. I enjoyed this latest Peter Ash adventure but am sad that I don’t have the next to turn to . . . yet. Share the post "Damm, now I’m caught up!"